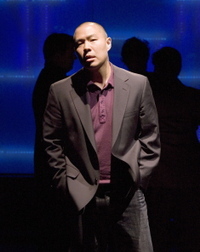 View From a Loft noted earlier that for lofties who want to discover what Grand Ave can offer downtown dwellers, it won't get much better than the premiere of David Henry Hwang's new satire "Yellow Face" now playing at the Mark Taper Forum until July 1. The reviews are in. Actor Hoon Lee portrays the playwright caught in the middle of his own advocacy of Asians to be cast as Asians--then selects a non Asian actor for a new production . lee said after Sunday's matinee performance that "a great thing about the script is it's about specific events, so you can tap into something more than an abstract idea." Those abstract ideas include what others may think an ethnic face is loyal to, or as the play recants, the question of where an Asian-American is from is nearly always followed by ..."no..where are you REALLY from?" Side Note: Another barrier broken on behalf of a different culture was the internet as exposition, alongside the traditional use of newspapers headlines and articles, all voiced by the actors in multiple parts. Up to now, online communication was for a more darker and perverse voice (although Instant Messages did not escape a token dig as the playwright was paying very close attention to a fan who found him online). Hwang use of online culture to advance the story, with no fanfare, shortens a gap between ink and links while expanding where racial and personal self-identity "really" comes from. Pictured: Hoon Lee. Courtesy of the Center Theater Group.